Mark your calendars for Saturday June 29th from 8:00 a.m. to 4:30 p.m. Enjoy a day of shopping, workshops, networking with other dancers, show and having fun. Vending with Desert Siren, DSD Medieval Needle, Plaza Studio and Yonnie Rocks Razzi. Doors open at 8:00 a.m. for shopping with the first workshop starting at 9:00 a.m. Shopping will be all day from 9 a.m. until 4:30 p.m. Stop by and shop even if you can't make the workshops. This year we will be having an evening show from 7:00 - 8:30 p.m. Doors open at 6:30. Enjoy an evening of belly dancing performed by workshop participants and instructors. Show is $5. Below is more information and times of workshops. with Yasmina, 9 - 10:30 a.m.
Tribal lends itself to fuse in different dance styles so easily. In this workshop we will take tribal moves, spice them up with Spanish flavor and add a shawl to top it off. You will learn tribal moves and combos along with how to work with a shawl and add the moves together with shawl work. Please bring a medium size triangle shawl, (62" X 30", does not include fringe), to the workshop. 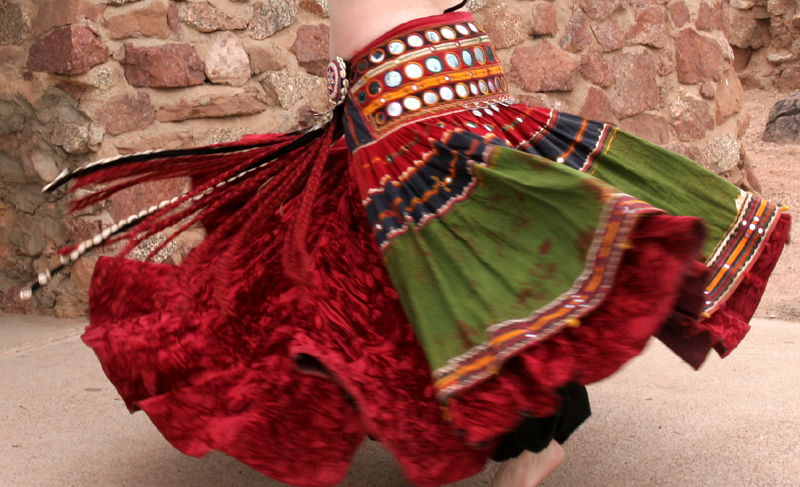 Yasmina has been teaching belly dancing since 1989 in the Phoenix area. She teaches workshops in and around the State of AZ and US and was honored to be an instructor at the Las Vegas Bellydance Intensive in Sept. 2012. In July 2011 she won Headliner of the Year at Wiggles of the West Dance Competition in Las Vegas; a goal she had worked towards for many years and finally achieved. Yasmina won Arizona Favorite Tribal Solo Artist 2013 and Arizona's Lifetime Achievement 2013. Yasmina�s TV show �Joy of Belly Dancing� lasted 13 years in the Valley of the Sun from 1990 � 2003. The show was both instructional and performance style with spotlighting dancers and musicians from all over the US. From the show Yasmina produced 5 videos for the market all performance videos. In 1990 Yasmina saw the need of an informative website on the Internet. With the lack of information about belly dancing on the Internet at the time she created her labor of love website, www.joyofbellydancing.com. Her website is known worldwide and still continues to grow informing dancers of this beautiful art form we call belly dancing. After her first belly dance class she was hooked and hasn�t stopped learning and dancing. Her style of dance is American with tribal fused in. American style is a fusion of many styles of belly dancing in itself and with tribal added in it creates a unique blend. with Suzanne O'Gara, 11-12:30 p.m.
Do you enjoy slinky, sultry movements, preferably while wearing black? Ever felt like you could bellydance...on Broadway? Have your friends expressed concern over your frequent use of "jazz hands"?? If you answered "yes" to any of these questions, this is the workshop for you! Come join Inanna LeFay for this fun and challenging workshop that will show you where Bellydance and Musical Theater - particularly the style of Bob Fosse - overlap, and how to successfully fuse the two styles for solo or troupe choreography. We will begin with a brief lecture on the style and influences of Bob Fosse (which include vaudeville and classical Indian dance), go through a jazz/bellydance fusion warm-up and series of drills, and then one or two short choreographies will be taught. In addition, we will touch on ways that typical Fosse formations can be used to enhance troupe choreographies, as well as some general musical theater wisdom that any solo performer, at any level, can use right away! Inanna LeFay (Suzanne O'Gara) is both an accomplished soloist and proud Director of both Alchemista Bellydance Company, the Phoenix area's first Dark Fusion and Theatrical Bellydance troupe, as well as Vraja Productions Gothic Theater Company. Though she began her studies in Classic Oriental Bellydance, Suzanne is best known for three distinctly different styles: Dark/Theatrical Fusion Bellydance, Turkish Rom, and her own signature style of Fosse/Musical Theater-influenced bellydance! Hailing originally from NYC where she worked as a singer/dancer/actress in musical theater and opera, Suzanne then moved to Arizona in 2009, and soon after, began studying (and later teaching) at Plaza de Anaya, and producing shows with Vraja Productions. After several years performing and teaching as a soloist, was chosen to teach at the 2015 Waking Persephone Festival in Seattle, having formed Alchemista Bellydance earlier that same year. 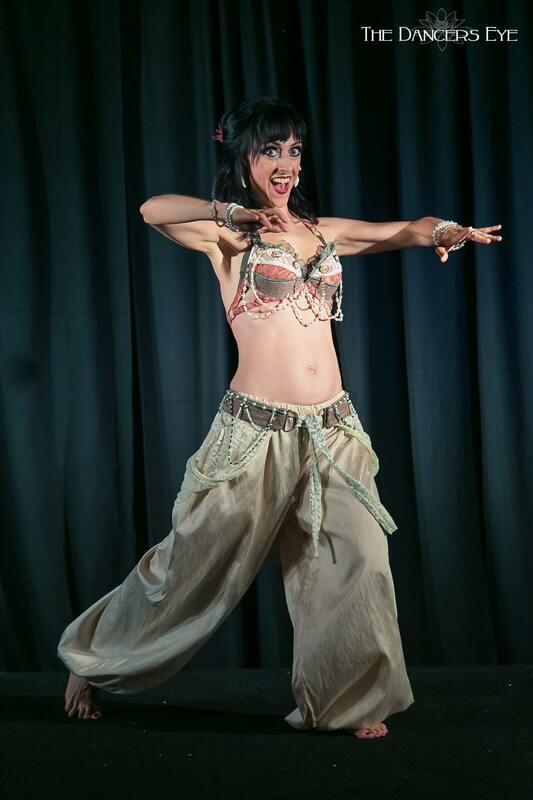 Since then, she has continued to perform both with her troupe and as a soloist at various professional and community events around the valley, and has taught at the Amethyst Dance Festival as well as Yasmina's Annual Swap Meet in addition to her weekly classes. She is jazz-hands-level excited to be a part of the 2019 Fusion Day team! Not just a bellydancer, Suzanne continues to teach voice, and can be heard singing as part of Mystic Sisters, a Celtic Rock group lead by Randi Baker. She is also a Certified Herbalist and owner of Alchemy of Avalon tea, herb, and perfume company, and currently works as the Herbcraft Professor for the Morgan LeFay Mystery School, run by Priestess and Bellydancer Demelza Fox. with Na-il Ali, 1-2:30 p.m.
Na-il is here today to share with you an Africanized Belly Dance fusion. It is themed around a lion hunt. Not in the context of man hunting a lion, but the embodiment of a big cat's movements as it hunts. This dance choreography is rigorous and will test your cardio by combining explosive arm and step sequences with languid seductive undulation sections. This workshop is designed around intermediate/advanced levels of dance, as it will be extremely up and down, and all around. From a very young age, Na-il Ali Emmert has had a fascination with muscular isolation and movement fluidity. Ever since he took his first dance class, he has had a passion for learning different techniques in dance that awe and stun an an audience. At first, dance was a hobby for him but since that first dance class, his love of dance has blossomed into a passion, which he now instills in others as a part time job at studios in Tucson, Arizona. 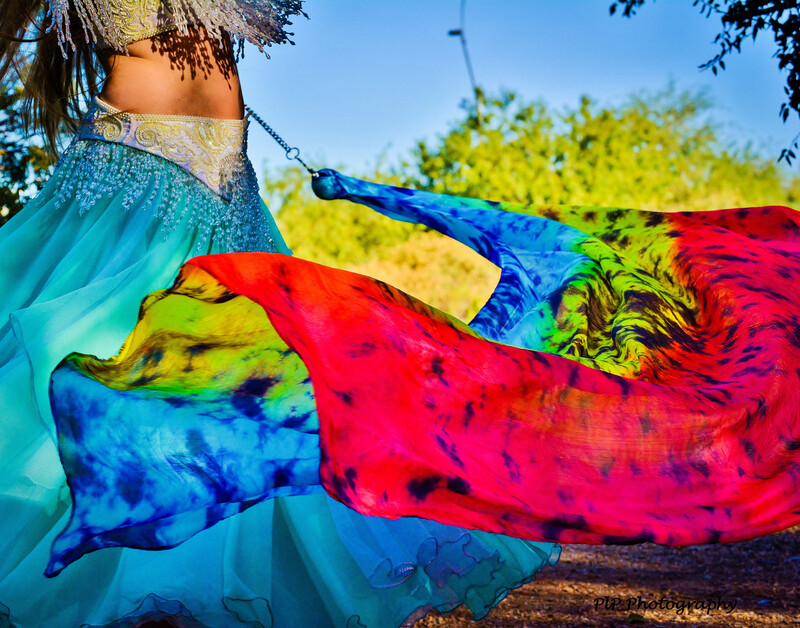 Na-il teaches in Tucson, and has performed at Amethyst Dance Festival, Phoenix Rising Dance Festival, Yasmina's Annual Belly Dace Swap Meet, Fusion Day and many more event. See him after his workshop for additional class information. with Diosa, 3 - 4:30 p.m. Welcome to the mysterious world of gritty reverb sounds, deep wobbles, and more! Learn a choreography that will have you thinking outside of the �music box� and embracing the unconventional riffs in alternative music. Join me for a whimsical, ominous workshop that will invoke your inner menace and playfulness. This dance is meant to be performed with dual masks, so bring one or two if you would like to �sample�, though masks are not required. This workshop can be tailored to any level, yet some basic dance experience will be beneficial. Diosa is an award-winning Phoenix-based dancer who has danced in the Valley-area since 2001. She fuses eclectic, electro music with her Egyptian Cabaret roots, enchanting audiences with her colorful double veils in Egyptian Cabaret, her energetic style in "Bellywood", her pop-and-locks in Belly Hop Fusion, and her experimental pieces for unconventional-themed shows. Her foundations led her to join Danah�s Arizona Belly Dance Troupe and Ava Fleming�s Black Opal, both based in Egyptian Cabaret. Branching out to other fusion troupes such as Melissa�s Unity in Motion and K-Lee�s Natium Tribal Dance, Diosa discovered her niche. She placed runner-up in the Fusion Category at Bellydancer of the Universe in 2004. She continued to take many workshops with master instructors such as Suhaila Salimpour, Jillina, and Rachel Brice. As a local instructor, Diosa taught foundations, choreography, strength training, and aerobic fitness for the City of Surprise, Luke Air Force Base, Synergy Center, Gold�s Gym, Naturally Women Fitness Centers and more. By day, Diosa is a Visual Arts teacher for 7-12th grades at a school in the West Valley, mother of two NAU graduates, wife to her handsome husband of 22 years, and pet parent to a menagerie of animals. By night, Diosa is the director and choreographer of The Desert Flowers and Osiris. They perform at local festivals and fairs, as well as events such as the Wild Wild West Steampunk Convention and Phoenix Fan Fusion. Diosa also teaches at her home studio where she holds troupe rehearsals, choreography crams, private lessons and drill classes. Her newest venture is taking on the role of Publisher of Shimmy Magazine, and she is always looking for contributors to extend their knowledge and experiences. As a teacher, performer, and lifelong-student, Diosa�s mission is to nurture her love of dance with kindred spirits through energetic movement, audience connection, and innovative dance interpretation. You can learn more about Diosa and her style of dance by visiting www.planetbelly.com. There are several ways to register for the workshops. You can register using PayPal in advance (see below) or cash at the door if room is available. Registrations will be taken at the door of the event if room is available. Thank you all for registering early! Please register early since class sizes are limited and workshops fill up very quickly. Sorry no refunds unless event is cancelled. You can transfer your workshop spot to someone else or donate your spot to someone that can't afford a workshop. Please let me know in advance. When registering for 2 or 3 workshops please comment which ones when paying with PayPal or email Yasmina, yasmina@joyofbellydancing.com or PM me on Facebook, Yasmina Parker with workshop selections. All workshops will be held inside and the floor is hardwood so shoes are optional.